It would seem like the very definition of looking for the proverbial needle in the haystack: using satellites to hone in on a 1/16-of-an-inch — about the size of the period at the end of this sentence — aphid-like insect under the forest canopy before visible signs of its destruction appear. But that’s precisely what master’s student Justin Williams set out to do as he began his thesis work three years ago, and it's just what he accomplished working with the U.S. Forest Service under the federal Pathways Program. Although there have been efforts to use satellite imagery to map the damage or defoliation caused by the hemlock woolly adelgid — an invasive Asian insect that first appeared on the East Coast of the U.S. in the early 1950s — Williams’ work is unique in that it set out to map the distribution of the pest before major defoliation occurs and do so at a larger scale than previous efforts, almost 9,000 square kilometers using Landsat imagery compared to less than 1,500 square kilometers via other methods. 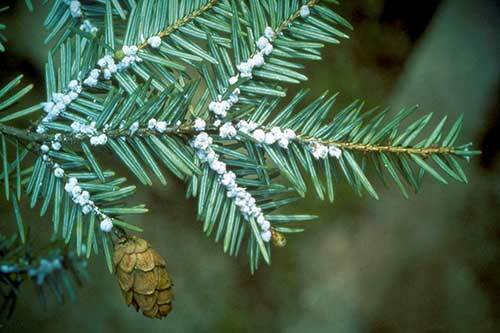 As of 2011, 18 states from Maine to Georgia had infestations of hemlock woolly adelgid. The pest can kill a hemlock in just a few years, sucking it dry of the nutrients and starch reserves it needs to survive. This increase in needle chlorophyll concentration — indicated by how certain wavelengths of light are reflected back to the sensor — turned out to be the key finding in Williams’ work. And it was what made it possible to find the needle in the haystack. Before the surprise finding, Williams and colleagues used modeling and groundwork to identify where they would find suitable hemlock habitat in their study area, which ranged from a bit north of Concord and west to Mount Kearsarge in New Hampshire and, in Maine, north to Biddeford. Just why infested needles contain greater amounts of the photosynthetic pigment chlorophyll is a mystery. 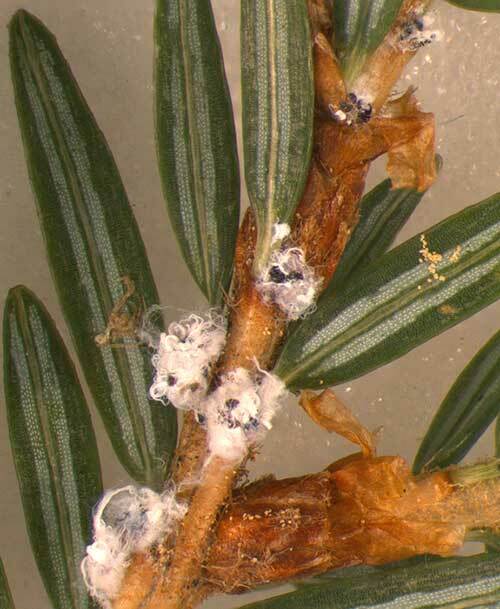 Williams’ research has indeed propelled work in this area forward and he hopes that it will eventually lead to formal procedures that could help lessen the damage wrought by the hemlock woolly adelgid. Since early detection has been and still is mostly boots-on-the-ground surveying, the newfound remote sensing technique could become a very powerful and cost-effective tool. “It could save a lot of time, money and effort,” Williams notes. But he adds that before the methodology can be rolled out for widespread use, more study would need to be done to determine if his master’s project work is repeatable and can be expanded to other regions with different topography and diversity of trees. Overall, he says, the project served as a good pilot study. And going for a doctorate is also not in the cards at the moment for Williams. Williams recently landed a job with the U.S. Forest Service Southern Research Station in Starkville, Mississippi. "As a research forestry technician, I'll be working with scientists on a project that studies the annual variation in bottomland oak species reproduction," he says, adding that his "remote sensing and GIS skills will be put to work through spatial analysis and mapping."